I dare say: New Jersey is becoming more cosmopolitan than Manhattan. With the price of the average apartment rising steadily even in these tough economic times, we suburbanites seem to be benefitting from the settlement of those seeking more affordable housing in New Jersey. I had the pleasure of attending a meeting with 50 suburban women recently to train as coaches for Girls on the Run of New Jersey East, and couldn’t help but remark to myself that there were a whole lot of gorgeous accents in the introductory voices. Their faces reflected different shades of nationality and they were all well spoken, fit, enthusiastic and friendly. I don’t get the same feeling whilst walking on the Upper East or Upper West Side of Manhattan anymore, and it feels as though every interestingly gritty neighborhood of Manhattan has been gentrified: TriBeCa, SoHo, The Meat Packing District, even Hell’s Kitchen-turned-Clinton is looking pretty spit shined these days. Recently, I went back to my old neighborhood that is Chelsea and was dumbfounded by all the art galleries that have sprung up on many side streets, that the Indian bodega on my corner is now a french bakery with rattan baskets of baguettes, les epis du pain, croissants and gallettes in its gorgeously designed window. The run-down brownstone next door to my old apartment has been renovated, the kitchen on ground level for all to see: reclaimed wide board pine floors with a center island in soap stone, gleaming copper pots hanging from the rack above it. The rat that used to scuttle about in the garbage cans in front long gone, a new row of perfect boxwoods having taken their place. We suburbanites are benefitting from the flight. Last week, my 12 year-old son took a school trip to Iselin, New Jersey to visit a Hindu temple, have a curry lunch and browse the Indian jewelry shops and mendhi parlors. Most of the children came home with intricate henna designs on their hands. In connection to the comparative study of world religions, the trip excited an appreciation for the rich culture that exists within our own home state. According to the 2000 census, New Jersey ranks 3rd in most heterogeneous states, approaching California and New York for the top spot. You can get it all here: aside from the Indian treasures to be found in Iselin, a friend who enjoys Asian cooking loves to visit Edison, where the yellow pages have forty seven listings for Japanese grocery stores. Even our own Montclair boasts an integrated, magnet school system that has made it attractive for families of all backgrounds. When choosing Montclair as an alternative to what we couldn’t afford in New York, it was advertised to me as “Brooklyn West:” a place where our children would live and flourish with racial and cultural diversity. Although I know our little hamlet is far from an inter-racial Utopia, it has provided us with a rich community made up of villagers of all backgrounds. My son’s trip to Iselin left me craving chicken tikka masala, so I shot up a half mile to Brick Lane on Valley Road and bought myself some. I could have walked, but I drove instead. This is suburbia after all. 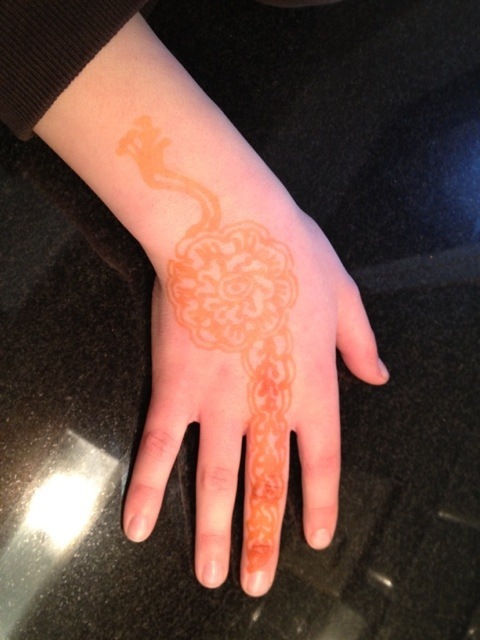 Mehndi design from Iselin parlor, a temporary skin decoration made by dying the skin with a paste made from henna. Traditional in India, Pakistan and Bangladesh, it is meant to symbolize the awakening of the wearer's "inner light." Yes! Go, New Jersey! I am a native Manhattanite and I do feel that all of the above is true.